The Ancient City of Muang Boran has got to be one of the most extraordinary if not spellbinding historical theme parks in Thailand. It's located on the outskirts of Bangkok on Sukhumvit Road, in Bang Phu Mai, Samutprakarn 10280, a sub-district of Samut Prakan Province, only a stone throw away from the city. Believed to be the largest privately owned open-air museum in the whole world, this immensely spacious park covers some 320 acres of land and features 109 replicas of Thailand's most important monuments and architectural wonders. This fascinating theme park not only displays a vast number of reproductions of Thailand's most famous structures at one-third their original size but also many historically restored buildings and sculptures. All were carefully selected and constructed under the supervision of the very best art historians in Thailand. Though this particular park is not frequented by hordes of tourists, it may be of great interest to you, should you want to learn a little more about Thai culture and Thai architecture. For these reasons, it could very well be worth a visit. The park could be described as a mini compact version of Thailand. I believe it was created by a local Mercedes-Benz car dealer who was in awe of the arts and culture of the country. So much so that the enormous piece of land on which the replicas stand, resembles an exact blueprint of the map of Thailand. 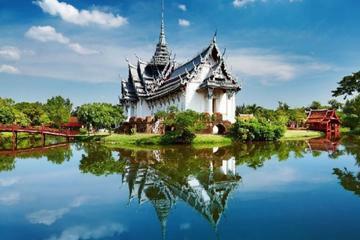 How would you like to take a private tour to explore the Ancient Museum of Bangkok? This open-air museum situated just 33 kilometres from Bangkok houses all the magnificent places of interest you get to see around the country. Please see above for more details. The entrance to the park is situated at the southern end of the map so to speak and the fee is just 150 Baht for adults and 75 Baht for children. From there, as you stroll around, you'll come across several scaled-down versions of some of Thailand's historical architectural masterpieces, each one set in the very regions on which the originals actually stand. The replicas here are perfect and precise reconstructions which take on an artificial and overstated version of the genuine artefact. Many appear to be fabricated versions with reference to Thai history, customs, culture and beliefs. Surat Thani, the Manohra Garden, Dvaravati Wihan, the Stupas of Phra Borom That and Phra Borom That Chaiya are all such fine examples. The reconstructed ruins of Dvaravati Wihan are a representation of the Dvaravati Kingdom, whose influence was at the centre of Hinayana Buddhism. These ruins flourished in the northeastern region of Thailand for more than a thousand years. Set among numerous architectural wonders on the grounds of the park is a replica of Sumeru Mountain, where various spirits ranging from deities in heaven to devils in hell are said to reside. According to ancient belief, Sumeru Mountain is the name of the central world-mountain in Buddhist cosmology. It's regarded as the pillar of the world and the centre of the universe. Alongside to the mountain, there are a number of mystical beings such as the strange serpent-like creatures called Nagas who are protective guardians against evil. Garudas and a few other bizarre and bewildering creatures can also be seen with each one individually distinguished by their own morality and wisdom. The ancient city has a fabulous little market place located along a narrow walking street with loads of shops and stalls on either side selling various handicrafts and souvenirs. Some of the stuff here is not seen anywhere else in Thailand so you might want to stop and do some shopping. It's also a great place to relax awhile. As you wander through the park you will notice that there is little left out in terms of the many ancient structures from around Thailand. It pretty much caters for all the historical sites, including those of the Ayutthaya and Sukhothai period. There is even some reconstructive history dating back the Khmer period, such as that of Prasart Hin Pranomrung, Prasat Hin Pimai and Prasat Pra Vihan. There are many distinct variations of architectural masterpieces and sculptures created specially in one confined area ranging from present-day temples to old worldly stupas. Many of the traditional structural styles are not only from different periods in Thai history, but there is also a strong Chinese influence here too. Places of interest include the Pavilion of the Enlightened, the Stupa of Prasat Phra Wiharn and the Stupa of Cham Thewi, Lamphun. While you are here, you can hire a futuristic two-wheeled, self-balancing electric Segway to tour the grounds. It's a heck of a lot better than trying to walk the whole distance around the park. It's also a fun way to travel, especially when it gets rather hot during the day. The photo above is an example of how they look. It matters not whether you are young or older, Segways are extremely easy to operate even if you have never tried one before. Lean forward to move forward, lean back to stop or reverse. To turn left, push handle bars left and to turn right, push handle bars right. It's that easy, so go give it your best shot. A full day Segway Tour of the park will cost you 4,500 Baht including lunch and cold drinks. If you like you could also rent a bicycle for the day at just 50 Baht - but this one excludes lunch.